Yacht 'Vent D'est' offers exquisite accommodation for 8 guests in 4 staterooms all with private ensuite bathrooms. S/Y 'Vent D'est'can be seen as one of the best examples of Dutch boat building expertise. She has a first class crew of 6, headed by Ben Marshal who has an excellent reputation in the charter industry. 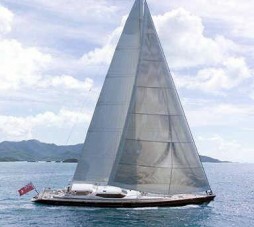 The large sailing yacht equipped with toys and with plenty of deck space, she is every yachtsmans dream. She is available for charter in the Caribbean and she is heading off to the South Pacific as part of her two year circumnavigation. Please contact us for her exact location.